As the nation heads to the polling stations and reaches the climax of one of the least/most (depending whom you ask) exciting general elections ever to have graced the democratic process, Marketing charts some of the seminal and silly moments of political parties, politicians and brands. Things got off to a fine start for the Conservative Party's advertising push, when it unveiled a poster promising: "Let's stay on the road to a stronger economy". 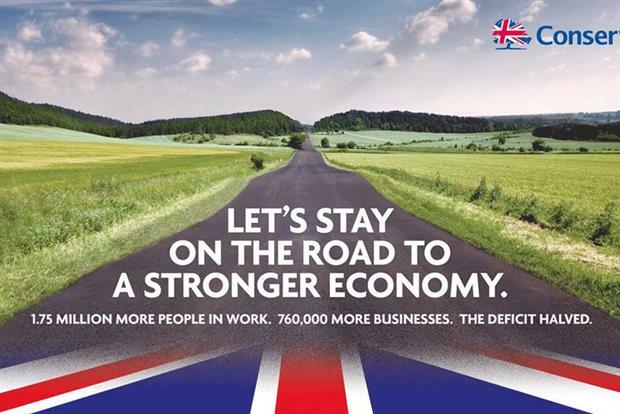 Apart from the clumsy phrasing (if it's a road "to" a stronger economy, and we're "on the road" then surely we haven't reached our destination of a "stronger economy"; ergo: the economy's not stronger), the image used in the ad depicted a road seemingly heading to nowhere. Also, when it transpired that the road used in the poster was not a nice, British road, but a German one, much guffawing ensued. Meanwhile, the Labour Party unveiled a poster, inspired by the much mocked 2010 poster, featuring David Cameron's pink mug, looking not that pink and very Photoshop smooth, warning the nation that the "Tories want to cut spending on public services back to the levels of the 1930s, when there was no NHS". 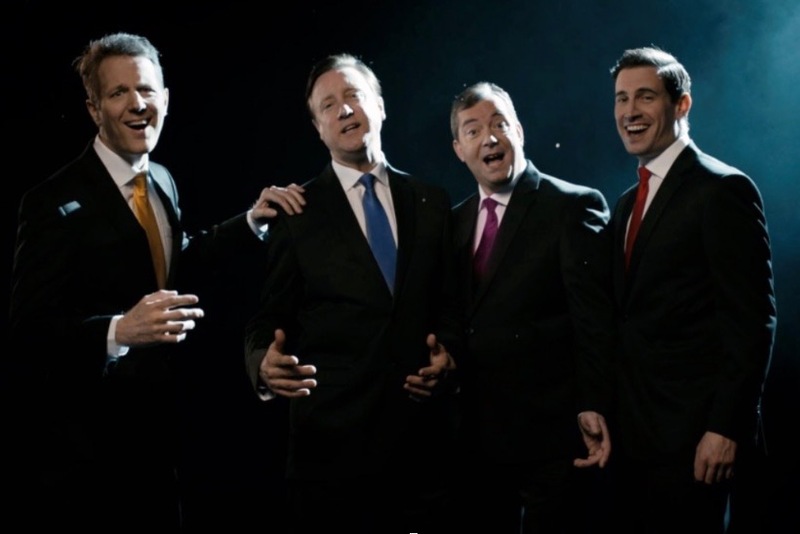 The Green Party riffed on the notion that there is little difference between the parties, and launched a 'Change the Tune' video on YouTube, which depicted four leaders (using vague-lookalikes) in a 'boy'- band. 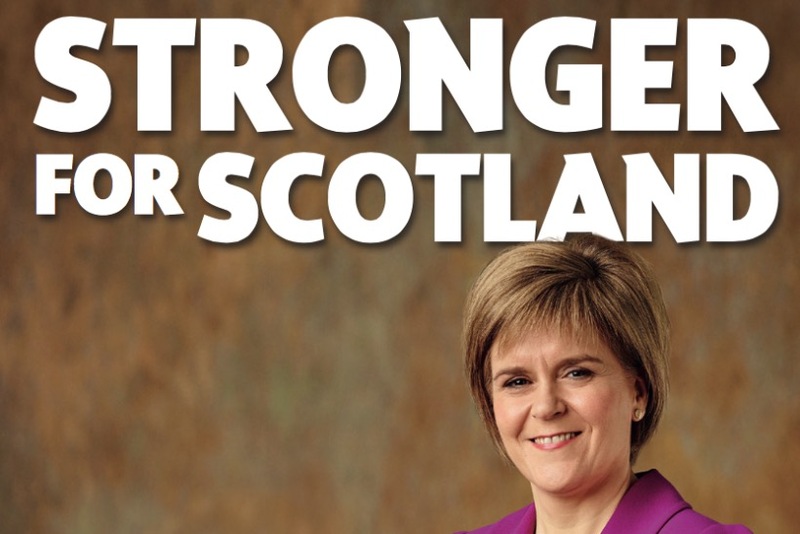 SNP leader Nicola Sturgeon has seen her star rise during this year's election campaigning, almost at the same angle of trajectory that UKIP leader Nigel Farage's plummeted, with 'Brand Sturgeon' coming to the fore with her stirling performance on the first televised Leader's Debate. Meanwhile, a week of election manifesto publication provided reams of scintillating prose/digital bum fodder for those without a good book to bury themselves in, with the Conservative, Lib Dem, Green and UKIP manifestos collectively publishing more than 450 pages of policy, posturing, and guff. Marketing kindly summed up some of the salient points for brands. Brands tend to wisely steer clear of associating themselves with politics, but there were a few exceptions. In typically irreverent style, bookies Paddy Power tapped into election fever with a less-than-flattering images of party leaders, the most disturbing featuring the leaders of UKIP, the Lib Dems and the Tories literally in bed with one another, in what it dubbed a 'Farage a trois'. Meanwhile, in a lovely parody of the Tories' famous 1979 'Labour Isn't Working' campaign, cake brand Mr Kipling reproduced the poster, substituting dole queuers for its French Fancies, presumably some reference to the scrounging European bureaucrats queuing for their expenses handouts. Given that the issue of gender stereotyping - particuarly of young girls - is so high on the feminist agenda, the idea of a pink bus to promote women would have been anathema to those opposed to cliched generalisation. 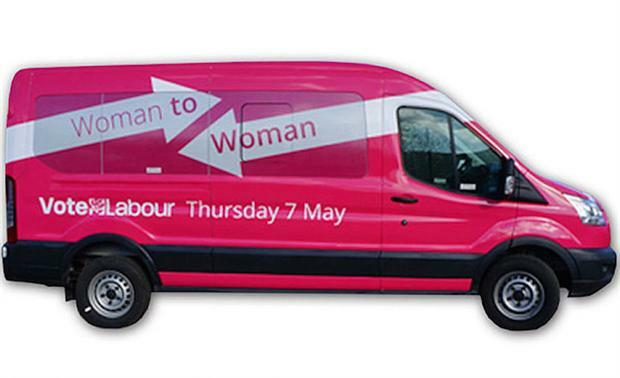 So, Labour's 'Woman to Woman' campaign bus was a great idea, obviously. 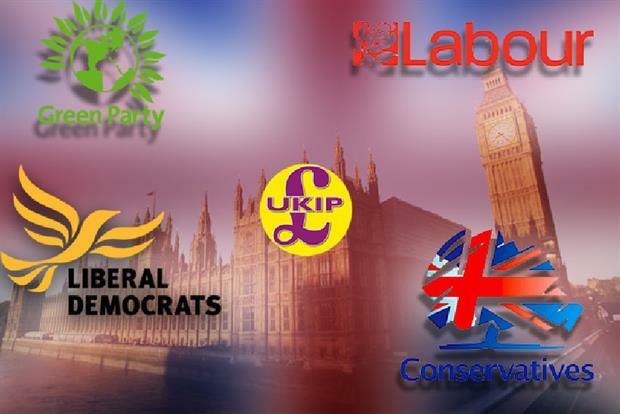 This election has seen several celebrities endorse some of the parties. Well, two parties really. Other than Hugh Grant backing the Lib Dems, Labour gained the vocal support of a far higher calibre of celebrity backer, including David Tennant, Steve Coogan, Martin Freeman and, surprisingly, Delia Smith. The Tories garnered the support of 'First Woman of Football' and, er, Tory peer, Karren Brady. It must have seemed like a good idea at the time as a way to win voters’ trust. 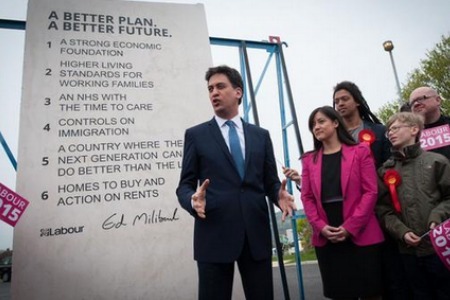 But when Ed Miliband unveiled the 8ft monolith engraved with his (pretty vague) pledges, the Twittersphere guffawing was almost instant. Apparently, it also cost £30,000 to make. Oh dear. Well, that's it. I'm sure we've missed out some other highlights, so please do point out our glaring omissions (Milifandom and Ed's attempt to sound tough with his "hell, yes" man-of-the-people vernacular, for instance); and we've not gone into much on the so-called social election (AKA preaching to the converted), but there's plenty in our annals, so do peruse. May your favourite party win the election, but it probably won't given that no one is predicted to 'win', in any traditional sense of the word. 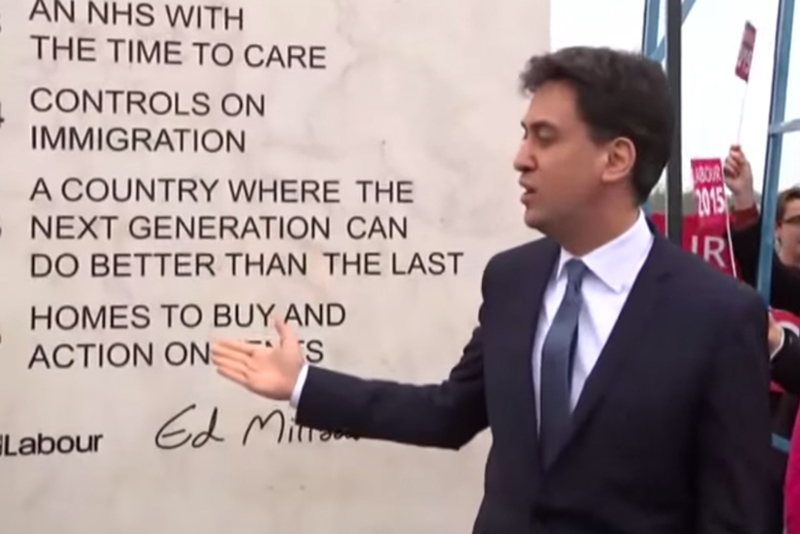 Watch out for our highlights on the forthcoming July 2015 election campaign *a nation sighs*.